I wish I could find the right words to express how I feel about our Annie "aka Paris." From day 1, Shelley has been awesome.. She makes the whole transaction seamless- she is professional, answers quickly and you are never left wondering how your baby is doing. Now about Annie.. she is the most gorgeous saint EVER.. she is a sweetheart, smart and easy going. If ever I purchase another saint, I won't shop anywhere else. Thank you Shelley.. much love to you and your family. We bought our puppy from Shelly and it was the best decision we have ever made. Shelly was so awesome to deal with, she was always in contact with us and kept us updated on how our puppy was doing and always sent us weekly pictures. At first was kind of leerie to give money to someone I didn't know and how the whole thing was going to work out but it turned into being the best experience ever. Izzy aka Rome when we got her and she was well taken Care of. All updated on her shots and very well fed our baby is so chunky and CUTE!! Overall a very great person and I would recommend anyone to go through Shelly and get yourself a Saint Bernard. Bliss Acres farm is the best!! Shelley was amazing and still is. She answered all my questions from start to finish and still answering my questions. Her puppies are BEAUTIFUL. We love Comet (Athens) so much already. I would definitely recommend her to anyone looking for a Saint Bernard. And most definitely will get another from her. Comet (aka Athens) is now 9 months old and 140lbs. He has been such a pleasant experience. I couldn’t ask for a better pet. As soon as I am ready I will be getting another Saint from bliss acres farms for sure. Shelley is still there when I have any questions at all. 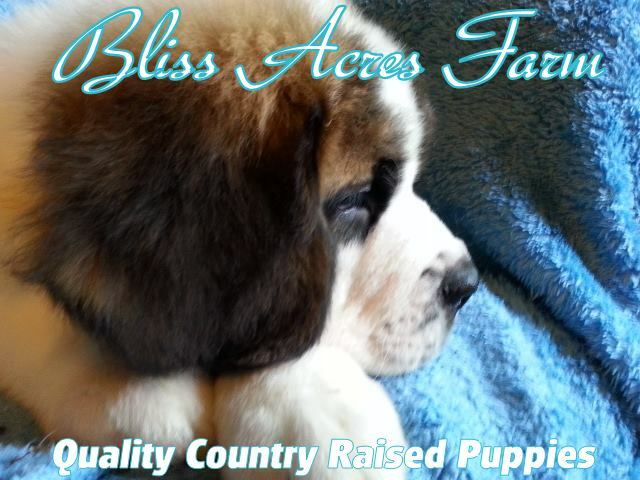 Bliss Acers farm is still my #1 recommendation for a beautiful Saint Bernard. Thank you soooo much Shelley for such a wonderful big boy. We can not wait to see what our years with him may bring and surly can not wait for our next trip to pick up the next member to our family. I have never ordered a puppy online. I contacted Shelley because of a picture of a puppy she had posted. I have always wanted a saint Bernard. Shelley was so sweet and caring. At the time she did not have a puppy available, but we still talked on our free time and eventually she had a puppy available...rebel :) I fell in love immediately. Shelley was so kind and worked with me on payments, I never felt rushed or hounded. Shelley even kept rebel an extra 2 weeks after the rest of the litter went to their new homes until I could make the last payment. The weeks before rebel came home, Shelley and I would talk everyday for hours and she would update me and send me pictures almost everyday! It was the best experience I have ever had. She loves her puppies like family. Like her kids. Rebel has been the best thing in my life! Sweestest, most loving, loyal family dog I have ever had. I have 3 small children and rebel is so gentle and so well behaved. these dogs have a special personality that will touch your heart. They aren't like any other dog I have owned. After I got rebel she still checks on him and I send her pictures...she still cares and is always here for me if I need anything! Best Experiance! Shelly made sure to keep me updated from the begining of purchase till end. When i purchased My puppy it was months before the mom was pregnant but shelly still kept me updated. Once my puppy was born i recieved pictures and updates on my puppy every week! Glad i came across her page when looking to purchase. Rocky has completed our family and fit right in with my other saint ( molly) just perfectly! Bliss Acres has been fantastic to work with from day 1. Shelley has been great and is always there to answer all your questions (even the silly ones!!) and was always prompt with her replies. We drove out over 20 hours to pick up our Shania Twain (now Willow!) and she is just an amazing puppy. It's only been about two weeks but she's beautiful, smart, and eager to learn. I can't wait to see her grow into the amazing service dog that she will become, all thanks to Bliss Acres ! Little miss Telluride (Telly for short) (aka: Tiny Tia - Micro-Teacup Chihuahua) is doing great!! I have never in my life seen a better socialized puppy! She loves everyone. She Is quite possibly the smallest dog I've ever seen. She has been eating just fine and has a great appetite. Thank you again for raising such wonderful little dogs and being able to bless us with her! Shelley's babies are amazing i bought one from her out of her Winter litter this yr. Shelley is super nice and will answer any question you have before and after you receive your baby. My puppy "Whisper" is now 6 months. Copyright © 2002-2017 Bliss Acres Farm. All Rights Reserved.